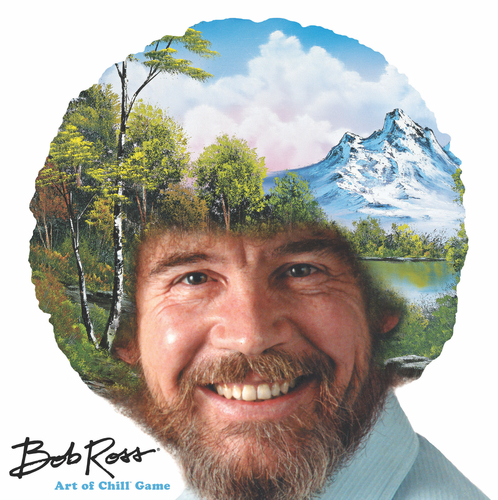 The Bob Ross: Art of Chill game is part of the impressive collection of games available at Target this fall. Many of these games are exclusive to that retailer, and the selection of games seems to be a combination of reprints from well known publishers (i.e. Vegas the Dice Game) while others are from relatively new entrants to the industry. Forrest-Pruzan Creative is one of those new companies, and they have a number of different imprints. I’ll admit that I’m a bit confused by them all – but I do believe that Prospero Hall is the name of the group that is responsible for the most strategic end of their games. 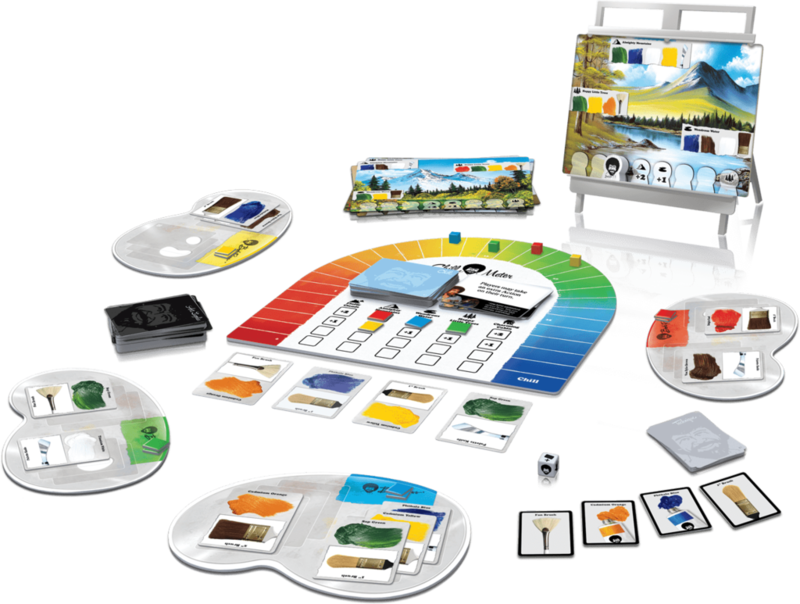 Despite the smiling face of the well known painter on the box, the game held within the box is actually a pretty great resource management game. In the game, players are artists that are competing to paint their own renditions of the painting that Bob Ross is painting as well. There are 15 double sided painting cards in the game, and one is randomly chosen to be placed on the easel in the center of the table. This is the painting that Bob is currently working on -–each painting has three different features on it (you know, fluffy clouds, happy little trees, almighty mountains, wondrous water or a charming cabin…). 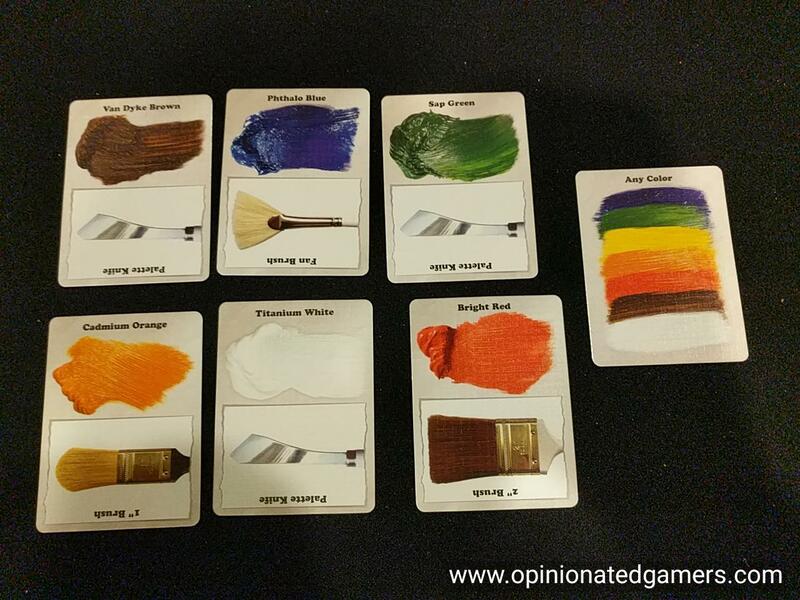 Each of these has a box on the card which shows which colors of paint are necessary to paint it as well as which sort of brush or tool is needed. There is a track at the bottom of the painting which shows the progress that Bob is making on his own work of art. There is a wooden token that stands on the easel ledge to show Bob’s progress. There is a scoreboard in the middle of the table which has the score track on it as well as room for the Chill cards. There are two other decks of cards: the art supply cards and the technique cards. Each of these is shuffled, and a display of 4 face up cards of each deck is placed on the table. Each player is also given a starting hand of three art supply cards. Each player is also given a personal palette board. This is split up into two sides – with spaces for three art supply cards on each side. On a turn, the active player first rolls the die (and resolves the action of that die roll), and then the player takes 3 actions. Points can be scored throughout the turn, and the game ends immediately when a player gets to the end of the scoring track – with the first player to reach the end of the track being declared the winner. On the die, there is a 50% chance that you roll a Bob Ross silhouette. If you do this, you first reveal the top card from the Chill deck and place it face up on the discard pile for that deck – and then read it aloud. This card might provide a one-time effect that is immediately triggered. Other cards will outline a bonus scoring opportunity that will remain in effect as long as this card is visible. Then, once the card has been read, you move the Bob token one space to the right on the easel. If Bob moves to cover a space with a painting feature silhouette on it, then Bob has painted that feature. If he moves to the rightmost space on the track, he finishes the final feature, and the painting is complete. If you do not roll a Bob on the die, then you’ll get to take an extra action. You might get a wild card to take any action of your choice (more on this in a second) OR you will be given the option for a specific action such as playing a paint onto your palette or drawing a random art supply card from the top of the deck. Earn a Technique card – If you have a pair of cards in your hand which match one of the four face-up Technique cards, you can discard them and take the matching Technique card from the display. Immediately score 2 Chill points for this. Draw a new card for the display from the deck. You will score bonuses each time you paint a feature which uses the tool or paint seen on your Technique card. Play then moves to the next player who first rolls the die and then takes his three actions. A painting is finished when either Bob moves onto the last space on the track OR a player completes all three of the features on the painting – the game pauses briefly. The current painting is removed from the easel. A new one is chosen and put in place. All players remove the Feature tokens from the scoring columns on the board. Then the game resumes where it left off. Again, the game ends immediately when a player makes it to the last space on the track. That player is the winner. 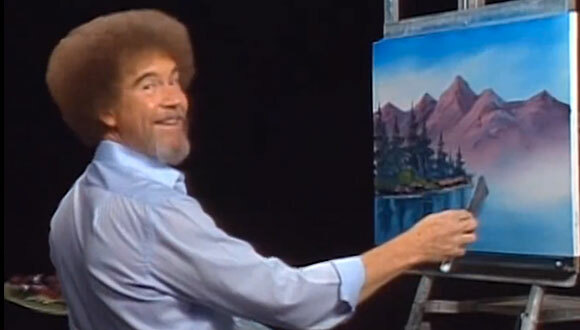 So, I didn’t know what to expect from the game when I first read about it, but as with many of my friends, I was enchanted by the mere idea of a game using Bob Ross as a main thematic element. I’m happy to say that the game uses the theme well, but it’s also a pretty good strategy game for the Eurogame crowd. As this game will have mass-market exposure, it could end up being a great gateway sort of game. At its core, the game is a resource management game. You must collect the right cards (both paints and tools) and have them in the right places in order to paint the painting features. This takes a lot of planning – and is made more complicated by the fact that you cannot “un-mix” cards played to a side of your palette. If that wasn’t enough, there is also a bit of a race element to the painting. You are racing against the other players as there are bonus points available to the first two players to paint a particular feature. You’re also racing against Bob – as there are bonus points to be had if you can paint a feature before Bob gets to it. Of course, there is more to do than just painting – and it is a fairly viable strategy to race to pick up the Technique cards. Not only do they give you a 2 point bonus for each one collected, they can help add to your bonus scoring for painting features painted later in the game. As the supply of these is limited (only 11 total in the game) – you’ll have to move on these quickly. For these reasons, I think that most Eurogamers will find this a decent game, and something more to their liking than most of the stuff you’d usually find in a big box store. That being said, when I look at the game from the flipside, there are a few things that I wish the game had for the casual gamer. Again, as I mentioned above, it’s a solid gaming design. However, it’s not really set up well (IMHO) for a novice gamer. First, the rules for scoring are somewhat convoluted. There is a base score and then up to four types of possible bonus scores. For a Eurogamer, it’s pretty easy to remember this… but, when I’ve played with non-gamers, the scoring requires constant re-teaching. My beef with the game in this vein is that there is not a player aid OR this information isn’t printed on the palette board for easy reference. Alternative, placing this on the central scoreboard would have been nice. Likewise, there are six different actions to choose from each turn. Again, by the middle of the first game, my gamer friends did well remembering most of the options (though everyone seems to forget the wipe action)… This would be another situation where a reminder/recap on the palette or central board would have been super useful. The artwork in the game appears to all be paintings from the show – they have Bob’s signature on them. The colors of the paint can be a bit close to each other, but the game seems to help distinguish them (especially for color blind players) by having a slightly different shape to the smear of paint in each color. Each of the seven colors of paint also has a name, and the colors are sometimes referred to only by name – and I wish that there was a more uniform method of depicting the colors (i.e. both the paint color shape as well as the name) to avoid confusion. 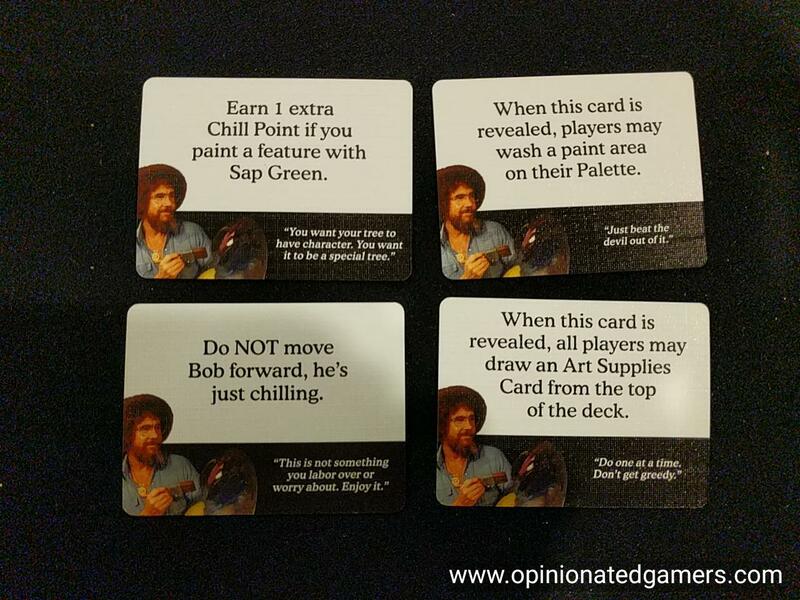 Overall, the Bob Ross: Art of Chill game is a delightful find. It is a solid strategy game that I will hopefully be able to point anyone towards. As it should be widely available at a mass market store, it’s easier to use as an example than something you have to order for an online specialty website. The game is simple enough to pick up for most folks, and while I think the scoring can be a bit convoluted for a non-gamer, it is this system which generates enough of a game to satisfy the more experienced crowd. 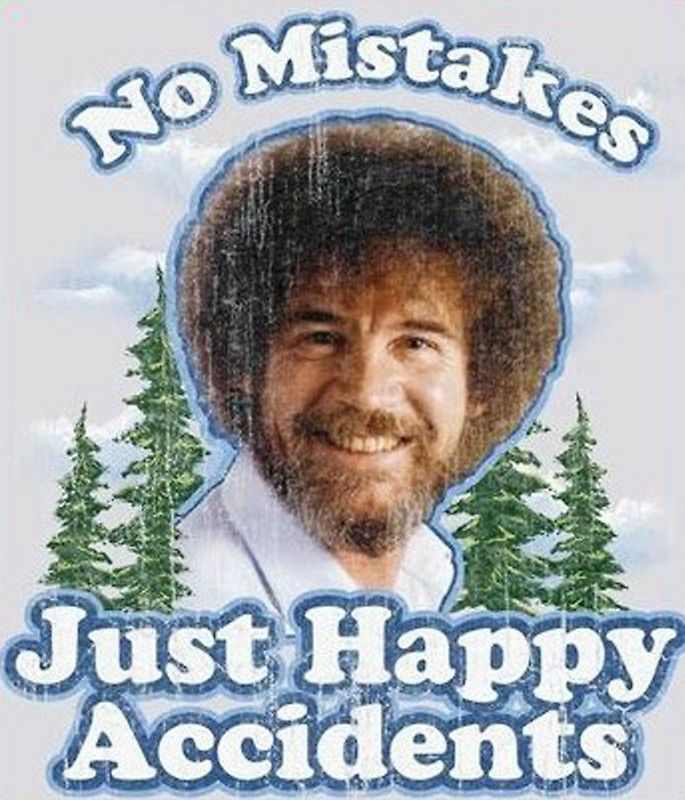 Regardless of ability/experience, most people should be able to get into the Bob Ross theme. In fact, we’ve had fun putting a video of the show (from Youtube) in the background as “mood music”. Karen M: I just want to echo some of what Dale said. 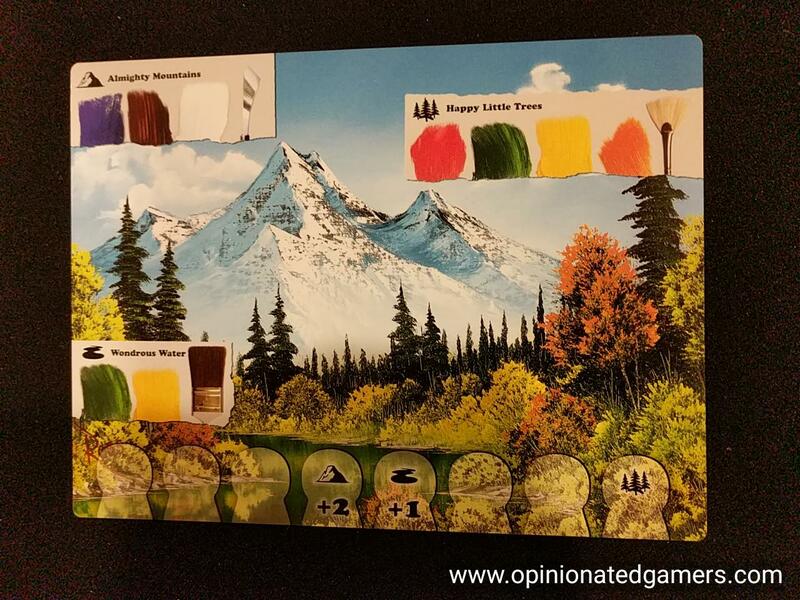 When I first heard about a board game based on Bob Ross my thought was something along the lines of “there is no way that is going to be good.” And I am astonished and pleased that I was wrong! There is a real game in the box that is pretty fun to play. This is really a race game which is not my favorite type of game, but the theme and the fact that there are “chill” cards make it worth your while. In the review, mentions are made to racing either the other players or the Bob token to completing the painting’s features. I can’t help but find such a gameplay element funny in a game with Bob Ross in it, much less the word “chill” in its title.